Last winter, at the Voices home/office in Chicago, we welcomed two friends who were in town for a Mennonite church gathering focused on the symbol of beating swords into plowshares. Their project embraces a vision from the biblical "Book of Isaiah" which longs for the day when "they shall beat their swords into plowshares and their spears into pruning hooks: nation shall not lift up sword against nation, neither shall they study war anymore." Our friends quite literally enact this vision. They use saws to cut guns and rifles in half and then hammer on the broken weapons, turning them into useful tools for gardening and light construction. Throughout the service, one of the men could be seen, on a screen, standing outside the Mennonite church hall, fashioning, with hammer and anvil, a rifle into a garden tool. Sparks flew with his hammer, but no-one was inflamed into anger. The fire our friends wanted to ignite was inside us. With what work can we replace war? If we are no longer training for war, what else could we be doing?" That winter night, at the Mennonite church, I couldn't help but think of another activist who had swung a tool last December, in this case, a sledgehammer, because she was inspired to confront weapon makers and encourage alternatives to war. Jessica Reznicek, age 34, didn't own the weapon system she wanted to transform. But she felt responsible to help the general public own up to its complicity with weapon systems funded by U.S. taxpayers. She took a sledgehammer to the doors of a major weapon producing company, Northrop Grumman, outside Offut Air Force base. In a written statement explaining why she swung her tool at the plate glass, Jessica asks people to understand that Northrop Grumman's weapon systems shatter and destroy the lives of people the world over. As one of the manufacturers with the largest share of the global Unmanned Aerial Systems market, (18.9%), Northrop Grumman profits immensely from peddling complex weapon systems often designed to be eyes in the skies monitoring targets for assassination. This kind of surveillance and extrajudicial execution generates intense anger and backlashes in other lands. It also promotes proliferation of robotic weapons. But the U.S. military and acquiescent institutions encourage us to feel that we've been made safer by complex weapons of destruction, and we should instead be frightened of a young woman wielding a sledgehammer to break a plate glass window. 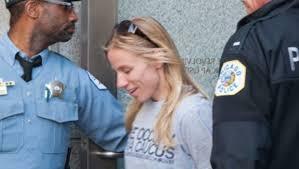 On May 24, Jessica Reznicek went go to a trial in Nebraska, expected to last two days, for her action. She has chosen to go "pro se," - to defend herself. Courts in the U.S. seldom allow the necessity defense. If the judge in Jessica's case does so, Jessica could try to defend herself saying she acted to prevent a greater harm. She could establish that the U.S. government consistently provides Northrop Grumman with lavish funding, devoting immense resources of materials and scientific ingenuity to the study of war, all desperately needed elsewhere. Northrop Grumman steadily experiments in perfecting the high-tech advantage of an empire bent on endlessly dominating the world through endless war. I wish that the testimony of my friends who literally beat guns into garden tools could be part of the courtroom proceeding. They urge us to make guns and other weapons unnecessary, using raw tools of compassion and service to heal the conflicts in which weapons are used. I wish my young Afghan friends here in Kabul, who live under constant surveillance of Unmanned Aerial Systems, could testify about their desire to refine tools of peace making and constructive service. They could assure the court that it's far more worthwhile to develop raw tools for producing needed goods and services than to develop weapon systems of mass destruction. Jessica's action makes me wonder if the "norm" in our society is the opposite of the biblical plowshares exhortation. Our major institutions study the ways of war comprehensively and our "top crop" in the U.S. has become weapons. Jessica encourages, one might even say provokes, discussion of the role militarism plays in our world. I hope the words of a legendary barrister in Ireland, Mr. Nix, who defended "The Pitstop Plowshares," can be recalled as Jessica's trial nears conclusion. Shortly before the U.S. led coalition began bombing Iraq in 2003, five activists invoked the swords to plowhsares saying from the Book of Isaiah and hammered on a U.S. warplane parked on the tarmac of Shannon airport. Ireland is a neutral country, and they believed that the U.S. Navy warplanes making "pitstops" en route to a war zone violated that neutrality. They undertook the action shortly after attending a retreat during which the Sisters of St. Brigid, in Kildare, Ireland had asked me to speak about Iraqis who suffered under 13 years of U.S. led UN economic sanctions. Before returning to Baghdad, I gave them enlarged, laminated photos of Iraqi children who were among the half million who died, according to the U.N., as a direct result of economic sanctions along with photos of children killed by an earlier U.S. aerial attack on the city of Basra. They used these photos to set up a memorial shrine next to the warplane they had damaged. Mr. Nix, preparing for trial, asked that I come to Dublin as a witness to help establish the defendants' motivations. I will never forget his closing statement in which he delivered a fiery indictment of war makers and described the hideous punishment wars inflict on innocent people, especially children. He ended his remarks by addressing everyone assembled in Dublin's Four Courts, saying: "The question isn't 'Did these five have a lawful excuse to do what they did?' The question is 'What's your excuse not to do more? What will rise ye?!' The Irish jury acquitted the defendants on all charges. No matter what the outcome of Jessica's trial, Mr. Nix's question, "What will rise ye?" abides. How can we, each of us, help lift the hammer of justice, cultivating a world at peace.